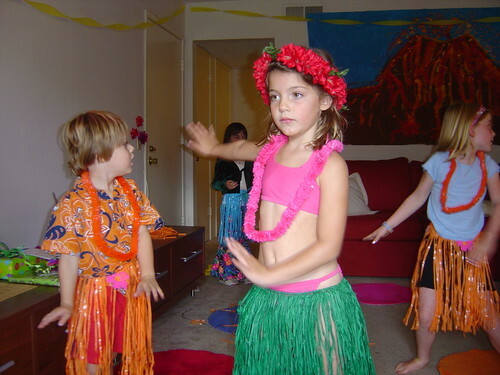 When M was a first grader, her teacher spent a good part of the year weaving Hawaii through the curriculum. The end result, for us, was a kid wildly obsessed with everything Hawaiian. Her friend donated the painting the class had made to use a a back-drop, and her friend’s mom (thanks, Dorit!) even made her a compilation of wonderful tunes to dance to. We made grass skirts for all the kids and they all got leis. M wore her pink bikini — in October(!). The only part of the party that didn’t fly as well as planned was the screening of a Hawaiian Volcano documentary that M insisted on. Not that M noticed, or cared, that her friends were not anywhere near as interested in the movie as she was. Have I mentioned that she has “Nova” set to record on the TiVo?